Note from Pastor Kevin: Dr. Brown’s debate offer includes a $10,000 finder fee for anyone who can find a person with a doctorate who is willing to complete a publishable written debate on origins based on science alone. Your article in the latest Scientific American (July, 2018, pp. 36-41) was intriguing. 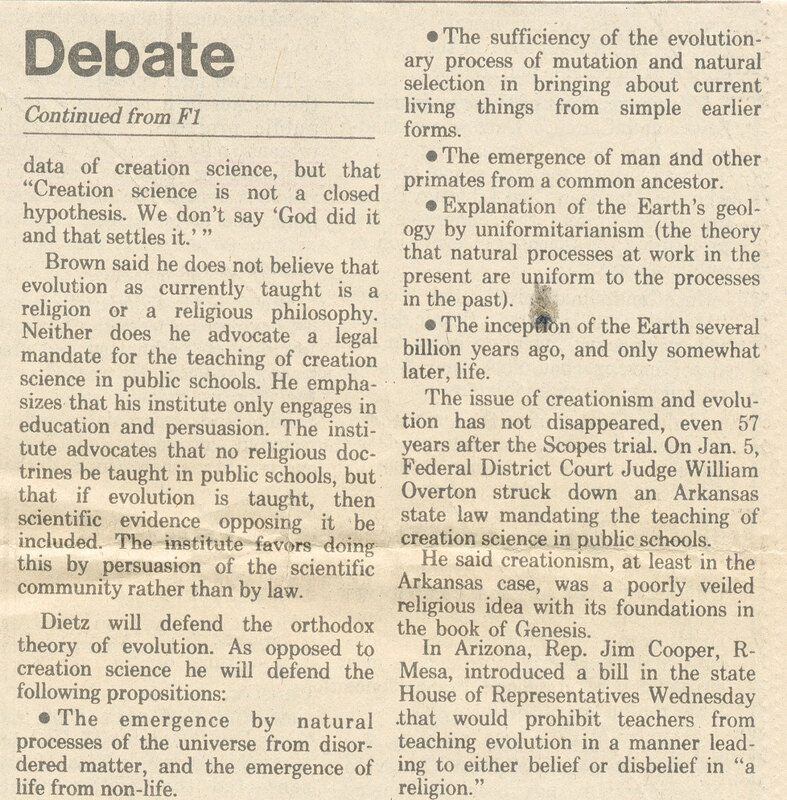 As you can see from my attachments that were published in The Arizona Republic in 1980, I am a creationist living in Phoenix, Arizona, and feel that the creation-evolution controversy will not be resolved until respected advocates on each side of this issue lay out their scientific cases in a formal written debate that is available to the public by allowing both sides to publish it. I consider you four, and any scientists at Arizona State University (ASU) who wish to join you, to be respected advocates for the belief in evolution. Are you and any others at ASU willing to do that? If so, I believe it would be a first, because I am unaware of any such written debate. Are you? How sad that people claiming to be objective and scientifically-minded avoid such a straight-forward approach to this festering question. It appears that one side of this issue—and Scientific American—may be anti-science. I am sending a cc of this letter to the editors of Scientific American, in case I am wrong and they are not opposed to a fair, thorough, and publicly available exchange of strictly scientific evidence on the creation-evolution controversy. If you are receptive to the idea of a formal, written, and publishable exchange of the scientific evidence and would like to discuss it, we could meet in either my office or yours, or discuss it by phone or email. My phone number is 602-955-7663 and my office,10 miles from yours at ASU, is near the intersection of Camelback and 20th Street. Thanks for your note. I am not interested in the debate, but I will also mention that I for one am not opposed to religion. More and more are realizing that by refusing to debate this foundational subject on strictly scientific grounds, evolutionists are the ones being anti-scientific. You and Scientific American can prove me wrong by finding someone to accept this offer. Students at ASU and other universities have challenged many professors to accept it; all have come up empty. 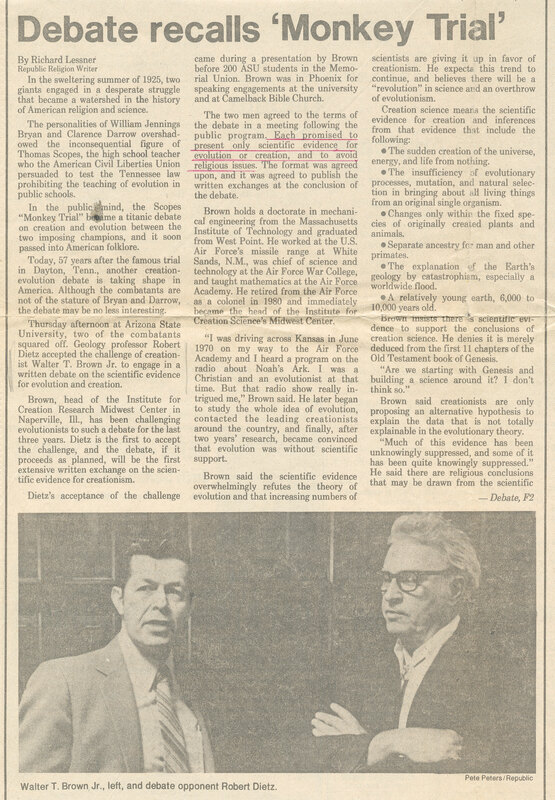 Bob Dietz, mentioned in the newspaper article I sent you from the Arizona Republic ( 6 February 1982, p. F1), was at the time probably the most prestigious professor at ASU. He accepted my offer after I made a presentation at ASU. He later backed out, saying that the subject could not be addressed without getting into religion. I’m afraid, Adam, that you have that same misunderstanding. 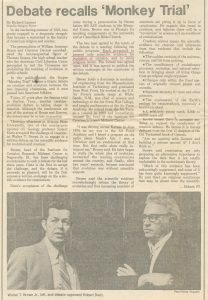 Scientific American, by giving you four psychology professors a platform, helped reinforce that error. Incidentally, people are surprised that Bob and I became friends five years after he backed out of our 1982 agreement, made in front of a full auditorium of students and faculty—and two reporters—to have a written debate. We remained friends until his death in 1995. For one academic year (1986-1987), we met for 3 hours each Wednesday afternoon to discuss scientific topics of mutual interest. Then we always went downstairs to the Geology auditorium, sat side-by-side in the front row, and listened to that week’s colloquium speaker. While our religious beliefs differed, we always exchanged scientific information cordially and frankly—something Scientific American should be fostering, not thwarting. Bob’s mind was encyclopedic. I learned a great deal interacting with him during that year, including major weaknesses in evolution and weaknesses in the plate tectonic theory, of which he was a major contributor. So you can see how your article, “The Science of Anti-science Thinking” (which was aimed at creationists such as me and about half of the American population) struck me. Frankly, it shows a lack of scientific understanding by four psychologists. 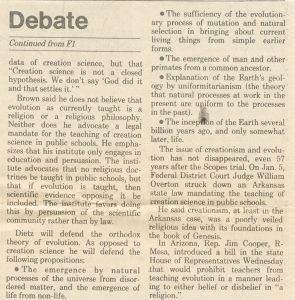 It is clear why you and every evolutionist who has been asked since 1980, don’t want to have a written, publishable, strictly scientific debate on the origins issue.